Driving To Save MoneyEliminate The Muda! « Save Time & Money – Opt Out Extravaganza! A friend once shared a story about their Uncle, he would take the batteries out of his watch every night figuring that they would last twice as long that way! It’s always amazed me to what crazy lengths some people will go. You ever know someone that would drive to the other side of town to save a nickel on a pair of socks? What about gasoline, do you know anyone that wastes 5 gallons in gas to save a few pennies? What is the truth, how far can you go to get gas and still save money in the process? According to the latest information from the Bureau Of Transportation the average passenger car in the U.S. gets 22.4 miles per gallon. The Energy Information Administration shows this week that the average cost per gallon of gasoline is $2.499. The cost of gas, I feel comfortable with. Having a little knowledge of cars and mechanics I honestly doubt that our fellow citizens are truly getting 22.4 miles to the gallon. While my assumption would be somewhat less than that, we will give our government the benefit of the doubt. Using a conservative number will allow you to drive farther and look harder to save a few pennies at the pump. Using these two numbers your average cost per mile (gasoline only!) is $.11. While the size of gas tanks vary as does the amount of fuel you may need when you decide to fill up I am going to use 14 gallons as the amount we need in this example. Needing 14 gallons, a person who obsesses about fuel prices and desires to save on gas can’t go very far. Think about it, to make the math work, you would need to save more than the $.11 it cost to drive each mile. Needing 14 gallons this means by driving just one mile the price must drop just under a penny or $.0079 per gallon. Drive 5 miles and the price would have to drop 5 times this amount or $.039. 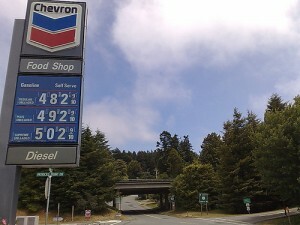 Drive 10 miles and the gas price would need to be nearly eight cents less or $.079 per gallon. How much do gas prices vary? My neighborhood is not a good representation, we’ve only got 2 choices and the difference between them is less than a mile. They rarely have a variance in pricing. 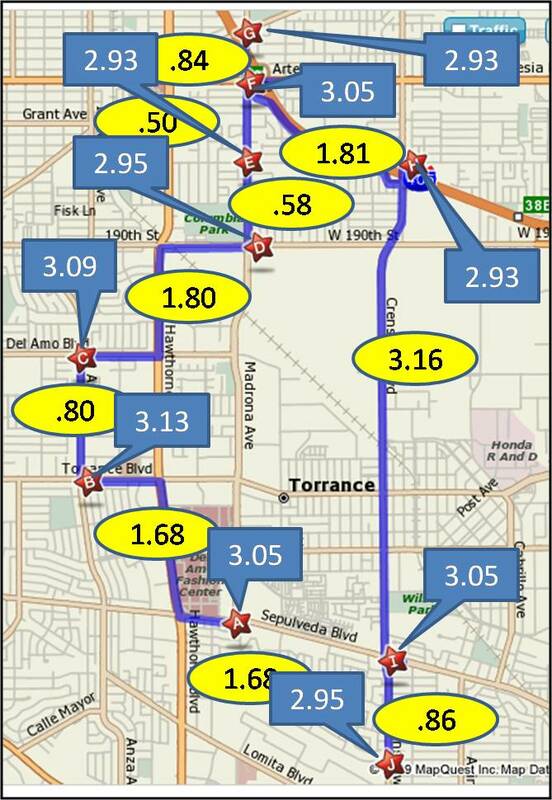 For this exercise I elected to use another area I am familiar with, Torrance California. 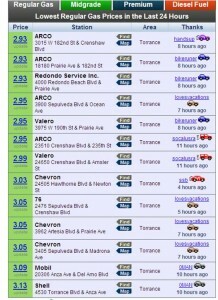 Below is screen shot of the gas stations in the area and prices from GasBuddy.com. If you found yourself at the most expensive option on the list at $3.13, your next option is to save .08 heading south a little over a mile and a half. Based on the $.11 threshold we’ve lost. Another mile and a half and we can save $.18 total. With 3 miles driven we’ve lost even more. Mathematically there are a few opportunities to save. For example if you found yourself North on this map at the station labeled F. Driving a half a mile south would enable to you to beat the $.11 threshold easily. In this case you will save a total of $1.68 on the 14 gallons. Keep in mind this doesn’t take into account the extra cost of your time or wear and tear on the car. I would be among the first in line to say that you have to count your pennies before you count your dollars. Only by looking at everything can you maximize your savings opportunities. At some point however, we must recognize that the time effort and energy that is expended in the pursuit of savings is just not worth it. In many cases, gasoline might be that point. If you drive 15,000 miles a year and even if you can save $1.68 with every fill up, it will amount to a total of about $80 per year. Frankly, you will save more gas and more money by making sure your engine is properly tuned, you have clean filters, fresh oil and properly inflated tires. As I noted previously, even these won’t compare to the difference you can make by changing your driving habits by “feathering the pedal”. Why go through this ridiculous exercise? To learn of course! How will we know when to make the effort to save and when it is not worth the effort if we don’t stop long enough to understand the implications of our actions? Does this mean that we never have to look at gas prices again? Not on your life! Take a look at the reviews of this gas station called Suncoast Energy near Orlando International Airport. GasBuddy.com doesn’t have them listed so I couldn’t find their current rate online. I did call; while other stations in the area are running about $2.35/gallon this station has regular gas priced at $4.29 per gallon. Buyer Beware! What is the craziest money saving story you’ve ever heard of? Please share yours by leaving a comment below.